The induction motor, when under Pulse Width Modulation (PWM) voltage coming from the variable frequency drive (VFD), is subjected to voltage harmonics (frequency components above the fundamental frequency). Depending on the type of PWM employed, the switching frequency and other peculiarities of the control, the motor may present efficiency decrease and losses, temperature, noise and vibration levels increase. 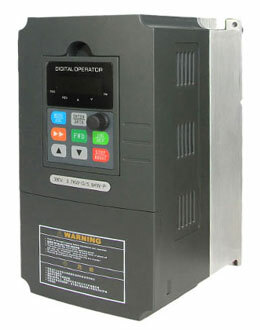 Furthermore other effects may appear when induction motors are fed by variable frequency drives. Insulation system dielectric stress and shaft voltages allied with potentially damaging bearing currents are well known side effects. Although not produced specifically by harmonics but by other matters that will soon be approached, these are important effects and should not be neglected. 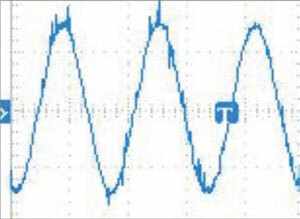 The motor current and voltage waveforms when under PWM supply are illustrated below. Then the motor fed by VFD sees a pulsating (PWM) voltage and a practically sinusoidal current, so that the voltage harmonics generally present higher magnitudes than the current harmonics. * All VFDs manufactured by Gozuk employ Space Vector Modulation. 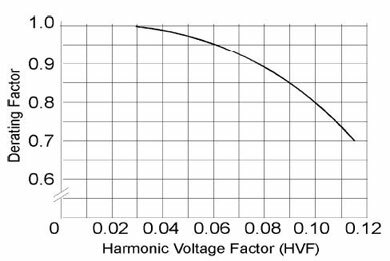 There is no international standardization defining maximum acceptable values for voltage and current harmonic distortion. However, the international standards do consider the increase of motor losses due to the non-sinusoidal supply. 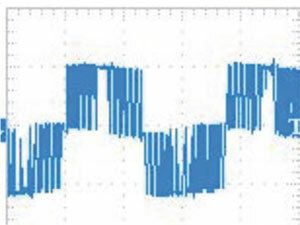 IEC 60034-17 provides an example of motor losses increase owing to PWM supply. Motor info: 315 IEC frame, rated torque and speed values.